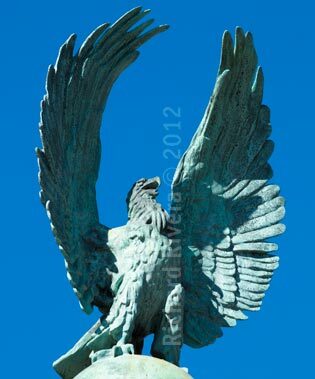 Who created the bronze eagles of the Grand Army Plaza in Brooklyn, New York? One of the most intriguing sculptors (and an accomplished painter) with work in New York has to be Frederick W. MacMonnies. His spirited bronze figures of the Soldiers’ and Sailors’ Arch monument at Brooklyn’s Grand Army Plaza, and the moving emotional gesture and stance of his Nathan Hale (the Revolutionary War soldier hanged by the British in 1776) at City Hall in Manhattan, are among the truly inspiring treasures of the city. The Brooklyn-Heights born MacMonnies worked as a studio assistant to sculptor Augustus Saint-Gaudens in the 1880’s, and studied nights at the National Academy of Design and at The Art Students League. It was during those years as an assistant that he met architect Stanford White, of the firm McKim, Mead, & White. His friendship with White became instrumental in attracting commissions throughout the years. In 1884 MacMonnies went to France to study sculpture, stayed, and opened a studio in 1888. He traveled annually to the United States to see dealers and patrons. His first major commission, erected in 1890, was the life-size Nathan Hale which stands at New York’s City Hall, near the spot where the actual Hale is believed to have been executed. After many awards and commissions MacMonnies was engaged in 1894 by the parks commission to create three bronze groupings for the Soldiers and Sailors’ Arch memorial, a monument to those in the Civil War, designed by McKim, Mead, & White. 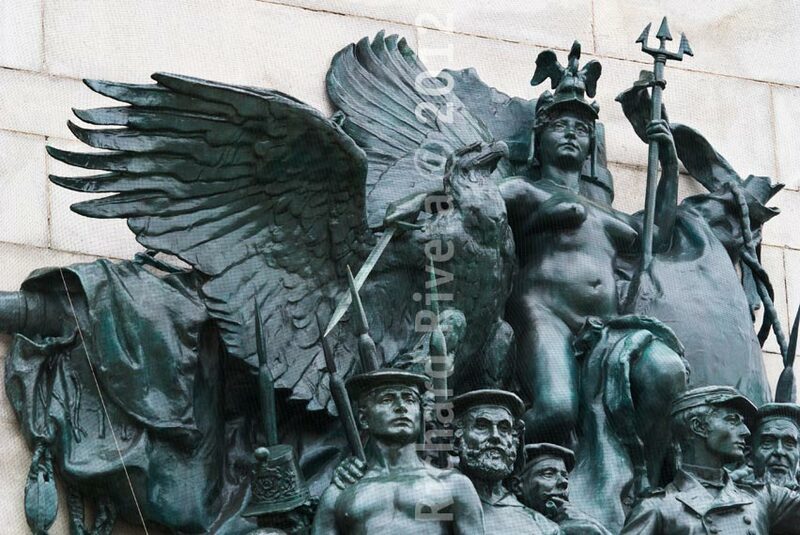 Central to the Sailors grouping at right of the arch, and being embraced by a heroic female figure of Columbia (a common poetic nickname for the United States in the 19th century), is a large eagle with a seven-foot wingspan. Its stance echoes the stalwart resolve of the soldiers. The triumph of battle is mirrored in the exultation of the four wonderfully animated bronze eagles facing the arch from atop the columns. Weinman studied art at The Cooper Union, the Art Students League, and served as assistant to Daniel Chester French and other major sculptors of his day. He preferred to think of himself as an architectural sculptor and created a wide variety of sculptures but became widely recognized as a medalist. He sculpted the lyrical Walking Liberty Half Dollar, one side of which has a stirring rendition of a striding eagle; the Mercury Dime (both minted in 1916); and also created the lovely 25 foot tall gilded copper Civic Fame that stands atop Manhattan’s Municipal Building, which many New Yorkers glimpse but rarely get to savor at its 580 foot height above street level. Weinman’s depiction of eagles for the Prison Ship Martyrs’ Monument in Fort Green, Brooklyn, are powerful, but the greatest examples of his work adorned the original Pennsylvania Station [also called Penn Station] in New York City which despite the international outcry was demolished in 1963. The original structure of Pennsylvania Station was a stunning example of Beaux-Arts architecture with its high arched entrances, doric columns, graceful steel arches at the track level Concourse, and considered by many a masterpiece creation from the architectural firm of McKim, Mead & White. Built in 1910 it boasted a facade of travertine marble and pink granite that covered nine acres of Manhattan’s west side. “New Yorkers will lose one of their finest buildings, one of the few remaining from the ‘golden age’ at the turn of the century, for one reason and one reason only: that a comparatively small group of men wants to make money,” wrote the news editor of Progressive Architecture on September 17, 1962. New York Senator Daniel Patrick Moynihan referred to it as the “greatest act of civic vandalism in New York’s history.” Many efforts were made to save the sculptural art of Penn Station, designed by sculptor Adolph A. Weinman, however, it instead led to the nationwide dispersal of its art treasures: an eagle at the Hicksville, Long Island Rail Road station; an entire entablature survives at Universal Studios in Orlando, Florida; the centerpiece of figures and eagles surrounding a clock survives as the Eagle Scout Memorial Fountain in Kansas City, Missouri; two eagles are at the Merchant Marine Academy at Kings Point, Long Island; and several eagles in Philadelphia, etc. 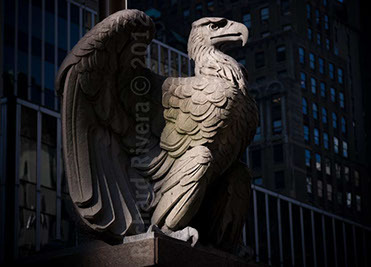 Only two eagles, remnants of the original Pennsylvania Station, remain at the sides of the new Penn Station entrance at 7th Avenue. They are two of six that originally adorned each of the four entrances. 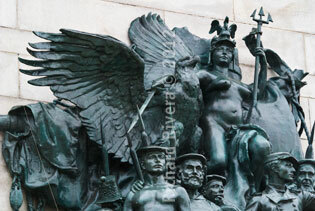 One of the triumphant eagles atop columns at Brooklyn’s Grand Army Plaza (top), and the Sailors group at the arch. Weinman’s eagles for the Prison Ships Martyrs’ Monument at Fort Green, Brooklyn. 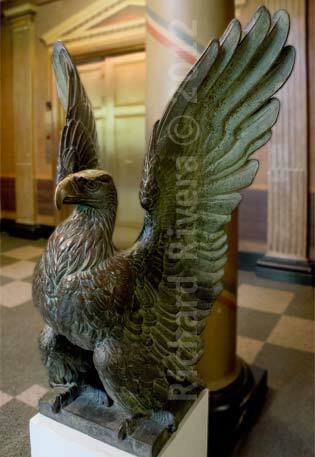 One of the two remaining eagles Weinman created for the original Pennsylvania Station demolished in 1963.